To kickstart their MPO Valletta 2018 International Tour, The Malta Philharmonic Orchestra will be performing at the Mediterranean Conference Centre on the 24th November 2018 at 11am. Under the baton of Sergey Symbatyan, this season’s tour concert sees the Orchestra open with Rebbieħa, a symphonic poem written by the late Gozitan composer Joseph Vella. The orchestra will then be joined by Austrian pianist Ingolf Wunder for Alexey Shor’s Travel Notebook suite for piano and orchestra. The concert will come to a close with Dmitri Shostakovich’s Fifth Symphony. Written months after his official denunciation, at the height of the Soviet Union’s Great Purge, Fifth Symphony famously ends with a cheerful finale that contrasts starkly with the tone of the rest of the work. Apart from the performance in Malta, the MPO Valletta 2018 International tour will also be traveling to Philadelphia, North Bethesda, New York, Moscow and Saint Petersburg between the 27th November and the 7th December 2018. Among the prestigious concert halls where the MPO will be performing, are the Carnegie Hall in New York, the Kimmel Centre for the Performing Arts in Philadelphia, The Music Centre at Strathmore in North Bethesda, the Moscow State Tchaikovsky Conservatory in Moscow and the Mariinsky Theatre in Saint Petersburg. 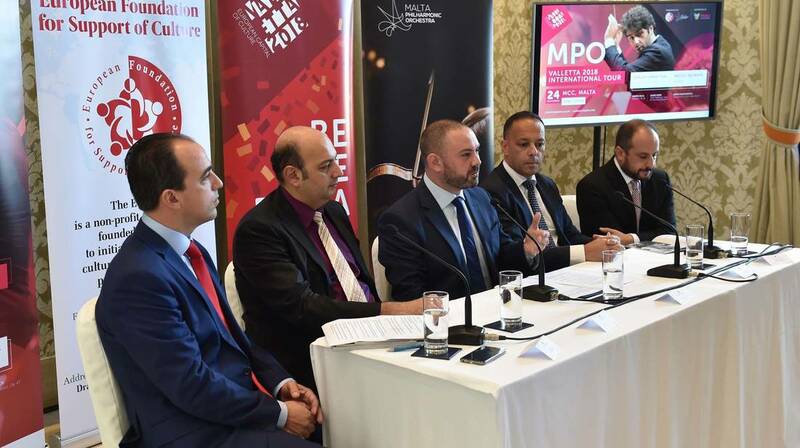 Minister for Justice, Culture and Local Government Owen Bonnici commended this important step for the orchestra, and stated “it is a unique opportunity for our country, as well as for our Philharmonic Orchestra, to be able to showcase itself abroad. The Orchestra has already performed in numerous concerts around Europe, so the next natural step was definitely to perform in other continents”. “Through this tour, we are celebrating our local culture and talent, whilst providing a stronger international platform of our local talent to a wider audience,” he continued. Valletta 2018 Foundation Chairman Jason Micallef said that “the Valletta 2018 Foundation has been working closely with the National Philharmonic Orchestra, and we truly believe in this collaboration”. He said that “these are the opportunities that we are giving, through public funds, hard work and insight. This is Valletta 2018. This tour in the United States and Russia will give strong visibility to our National Orchestra “. For more information visit www.maltaorchestra.com. This event is created and organised by the Malta Philharmonic Orchestra in collaboration with the European Foundation for Support of Culture, and is supported by Valletta 2018.